The Mean Absolute Deviation Around the Median is a measure of dispersion of a set of data points. It can be used in place of the Median Absolute Deviation (Around the Median) as it returns a smoother curve. The The Mean Absolute Deviation Around the Median is a measure of dispersion of a set of data points. It can be used in place of the Median Absolute Deviation (Around the Median) as it returns a smoother curve. Calculation: Median Absolute Deviation (Around the Median) of the selected data set is the arithmetic mean of the absolute deviations from the median of the data set. 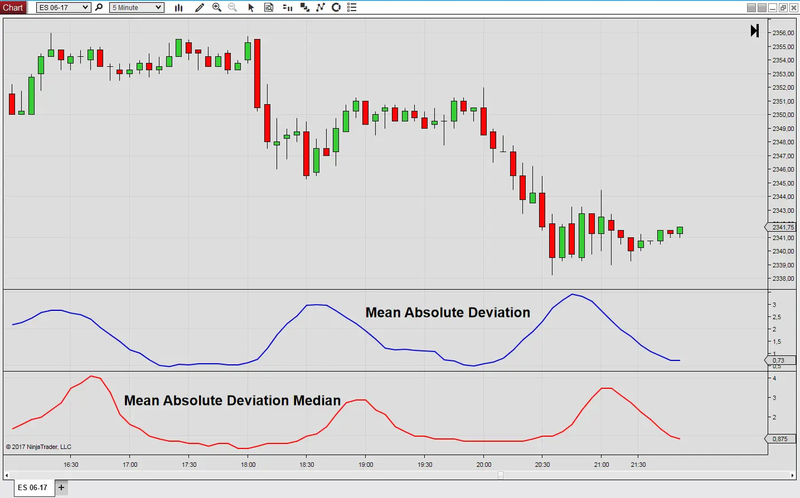 The Mean Absolute Deviation is calculated from price data over the selected lookback period. We take the absolute values of the differences and calculate the arithmetic mean. The indicator which can be downloaded here is the mean absolute deviation around the median. The mean absolute deviation is looking at the absolute differences where the standard deviation is calculating the squares of the differences. The median minimizes the mean absolute deviation, whereas the mean minimizes the standard deviation. Large outliers will have a far lesser impact on the dispersion, when the mean absolute deviation around the median is used instead of the standard deviation. The mean absolute deviation around the median is always smaller than the standard deviation. When the data is normally distributed the standard deviation is about 1.2533 times the mean absolute deviation. The exact factor is obtained as the square root of π/2.